Excited for a Colorful Year! 2012 was an intense, prolific and creatively fulfilling year at Sasha Photography. Moved into a new studio, traveled to Kauai, Burning Man and twice to Cabo San Lucas (once for my own wedding!). 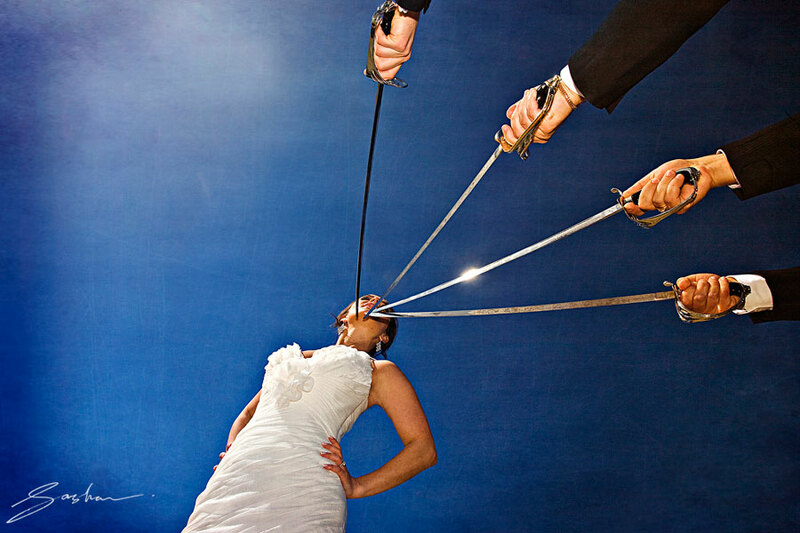 As you may well know, January and February is prime booking season for wedding photographers. Check out this interesting chart from Google Trends. You can probably guess that the big spike in “wedding photography” searches at the end is what happens after many couples get engaged over the holidays. Naturally, 2013 is booking up and promises to be full of new adventures. 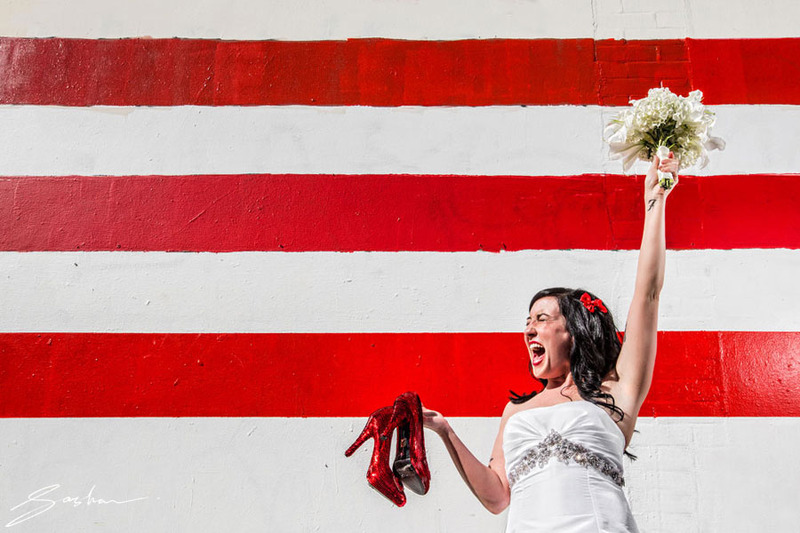 For inspiration, check out some of my favorite bold wedding photographs. You can follow Sasha Photography on Facebook to stay up to date on the latest photos and news. Enjoy these images, and take the time to read the ‘making of’ story behind each one. I think you’ll find that they were all a combination of my vision, improvisation, and the couples’ willingness to play! The above photograph was taken at a beautiful venue called Ralston Hall, which is now sadly closed for renovations. Monika purchased her gorgeous couture gown in Paris, where she and Vincent met while studying abroad. I felt that the striking gown needed an equally striking backdrop. Fortunately, Ralston Hall happens to have an incredible bamboo grove outside in the garden. Robyn and Nathan were awesome to work with. They had great style and a lot of flair. The whole day I was inspired by Robyn’s bright red lipstick, hair bow, and glittering, sequined red shoes. It wasn’t until our excursion through San Francisco’s Chinatown that we stumbled upon a huge American flag mural. When I saw the red and white stripes, I knew immediately that an audacious image was imminent. Lily, Jeff and their guests were on a Cable Car tour of SF, when I asked the driver to make a quick unscheduled stop. I’m always drawn to vivid colors, and so when glimpsed the corner of this interesting-looking warehouse, I knew we had something special. We jumped off the cable car, walked about half a block (while the drivers honked like mad for the wedding couple) and then played around in front of this blue wall until we got this shot! This image was taken in London – ironic because the lettering on the doors is in French. London weather is much like that of San Francisco, so during the shoot I felt right at home on that dull, foggy day. Fortunately, this also meant that we had beautiful soft, diffused light to work with. When I saw this gorgeous doorway, my eye was immediately drawn to the burst of color. 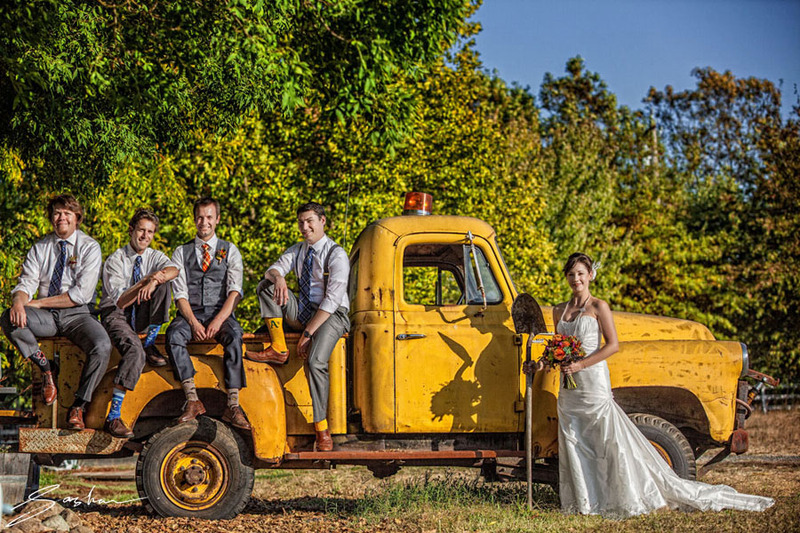 Jen and Chris had a lovely fall wedding in Sonoma. The venue just happened to be a parking lot for old, rusty trucks, and the burnt yellow was a perfect color to complement the color palette of the day. Throw in four handsome groomsmen, some awesome A’s baseball socks, a bride and groom with a great sense of humor, and a splash of American gothic, and this is what you get! Silvie and Christian came to San Francisco all the way from Singapore, and asked me to be their tour guide for an engagement shoot around town. They were drawn to the bold colors and striking concepts in my work, and so they asked me to plan an itinerary that reflected this. 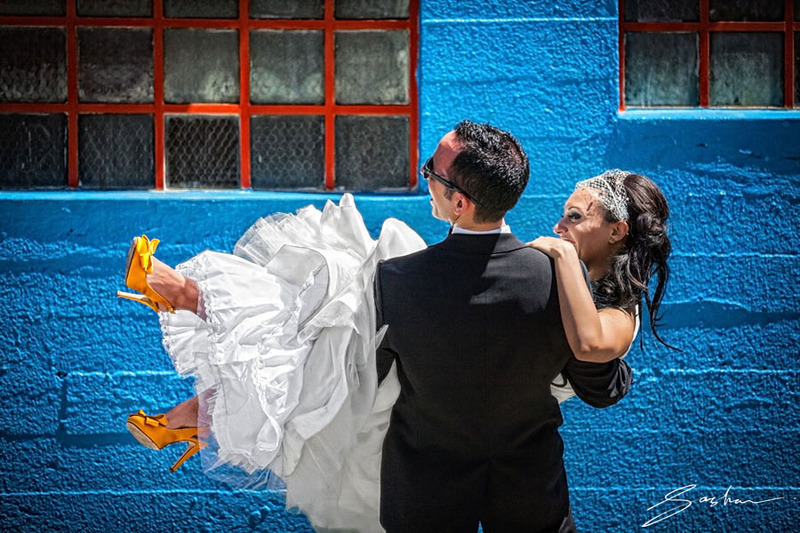 Sylvie wore crazy big heels and a couture gown, and so naturally I thought to take them to the mid-Market area around Mission Street, where copious murals (but also some unsavory characters) are always found. Granted, it was a little strange to have Sylvie traipsing around the ‘mean streets’ of San Francisco in her wedding regalia, but the couple were great sports about it, and it was certainly worth it!! Paris is full of inspiration. I was fortunate enough to spend a long day of shooting around Paris’s landmarks and districts, but this was actually one of the first photographs taken that day. 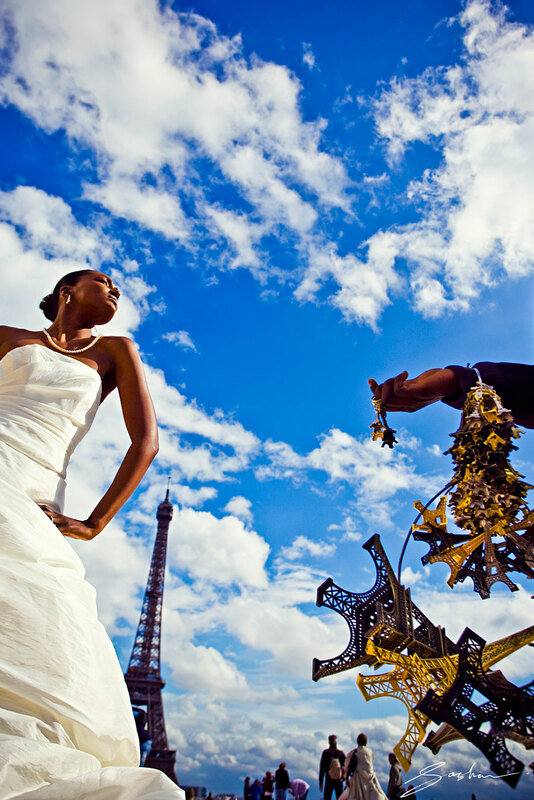 We were at the Trocadero Plaza, from which an incredible view of the Eiffel Tower unfolds. Naturally, it’s a popular tourist destination, and therefore chock-full of street guys hawking their wares. I love that the wide angle lens I used for this shot makes the actual Eiffel Tower in the background almost the same size as the ones on the keychain. Remember Sylvie and Christian? Well, this was another one of our engagement session destinations. By this time, they had changed outfits, and we were playing around with all the beautiful silk scarves they had brought with them. 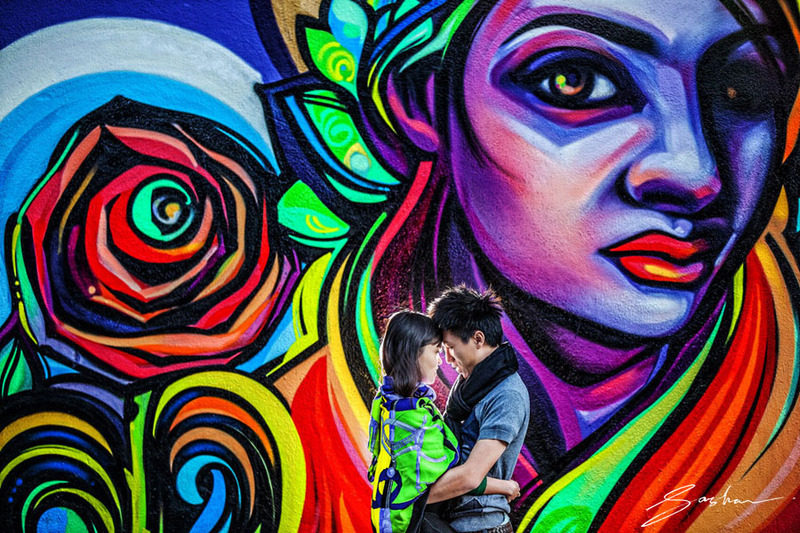 When we found this mural, the particular green scarf seems to fit so well. Throw in a dash of light and a wonderful connection between them, and we have this image. I was driving behind the wedding party limo when I suddenly saw what would become this image. Yelena and Greg were super open and playful the entire day (perhaps you notice a trend – all my clients feel they can trust me and are willing to play to create these types of images). Anyhow, as we were driving through the Presidio, I spied the University of San Francisco ROTC cadets, in full dress uniform, doing sword drills. We stopped our convoy, and I asked the guys if we could quickly borrow their swords. Well, when you have a gorgeous bride like Yelena in her wedding gown, it’s hard to say no to such a request. So they handed over their weaponry to the groomsmen, and we made this indelible image! Guess which hand belongs to Greg, the groom!